Block Car-key FOB Signal - Keep your car's security system from getting hacked. 1 x RFID Pouch. 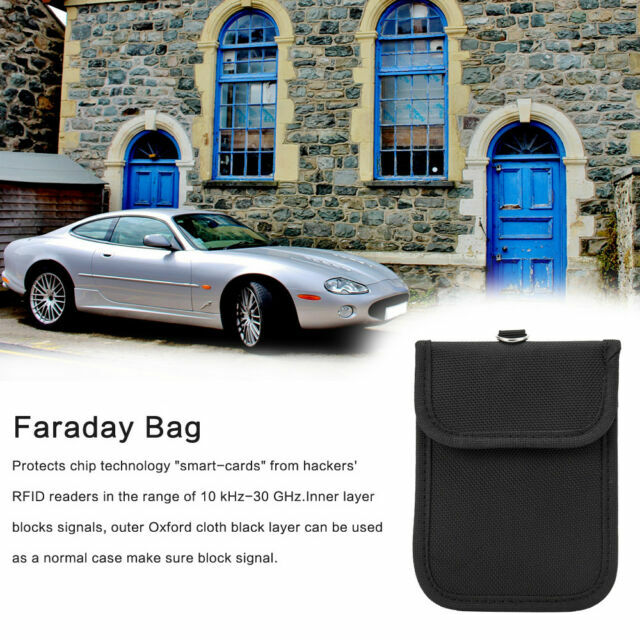 Convenient and portable - inner silver layer blocks signals, outer Oxford cloth black layer can be used as a normal case - a modern and fashionable design. A must for keyless ignition. Up until receiving this wallet I thought wrapping my key in aluminium foil would stop someone stealing my car. However, it didn’t work. I have now tried the key in the wallet and the car just sat there lifeless. A raving success. My advice to all owners of keyless ignition is that a few pounds could save you thousands. Go buy one! The bag is useful and certainly protects the key from unauthorised use. As a woman, who had smaller pockets in clothes, it sometimes makes the key more difficult to carry around. Very good product and is a nice size to easily hold the car remote plus it works as required. Makes life easier as it has 2 pockets. Plus it also has a ring to attach my house key.